MINNEAPOLIS (AP) The Super Bowl still a day away, the Minnesota Timberwolves were the hot ticket in town – and not because there wasn’t anything else to do on a frigid Saturday night. While Wolves teams of previous seasons didn’t give the home crowd much to cheer about, this season’s squad gave the celebrities in town for Sunday’s football game a taste of what has the local fans excited. Jimmy Butler scored 30 points, Karl-Anthony Towns had 22 points and 16 rebounds for his league-leading 47th double-double, and Minnesota beat the New Orleans Pelicans 118-107. With the likes of Floyd Mayweather, Sting, Guy Fieri and others in the crowd, the Wolves jumped to an early 16-point lead and had an answer for every New Orleans run en route to their 12th straight home win, and a four-game season sweep of the Pelicans. ”Obviously we didn’t want to disappoint any celebrities coming in,” Towns said. They didn’t disappoint the regular fans either. The home winning streak is Minnesota’s longest in a single season since a 14-game streak in 2003-04. Anthony Davis led New Orleans with 38 points and managed to keep the Pelicans from getting completely blown out in the first quarter, when the Wolves opened a 22-6 lead. Davis scored 19 first-quarter points to help the Pelicans pull within single digits at times, but Minnesota shot 50.5 percent on the night to steadily maintain its lead. ”You can’t play uphill the entire game,” Pelicans coach Alvin Gentry said. Nikola Mirotic scored 18 points on 6-of-13 shooting in his first game for New Orleans since being traded from Chicago on Thursday for Omer Asik, Tony Allen and Jameer Nelson. Mirotic hit back-to-back 3-pointers in the third to pull the Pelicans to 90-79 before Towns closed the quarter with a three-point play and a dunk. Tyus Jones had 15 points off the bench for the Wolves. Andrew Wiggins had 15 points for Minnesota and Taj Gibson added 12. Pelicans: The team gave Emeka Okafor another shot at the NBA by signing the veteran forward to a 10-day contract. Okafor last played in the NBA in 2013 before being sidelined by a neck injury. He’s played 26 games in the G League this year, averaging 6.8 points and eight rebounds per game. ”Obviously it’s a never-give-up attitude to get your way back to where he is right now, and so it’s just a matter of him being able to perform and stay at this level,” Gentry said. Okafor was available but didn’t play. Timberwolves: Coach Tom Thibodeau had no comment on recent ESPN reports that Shabazz Muhammad has requested a trade. ”I didn’t see it,” said Thibodeau, who is also the team’s president of basketball operations. Mirotic didn’t get much time to prep for his first game with his new teammates, who played the second night of a back-to-back. He said he met with coaches and watched film in the morning, and the team didn’t hold its typical shootaround. ”It was helpful and those guys make it very simple for me tonight,” Mirotic said. Pelicans: Host Utah on Monday night. 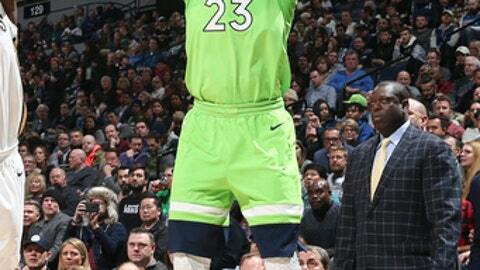 Timberwolves: At Cleveland on Wednesday night.